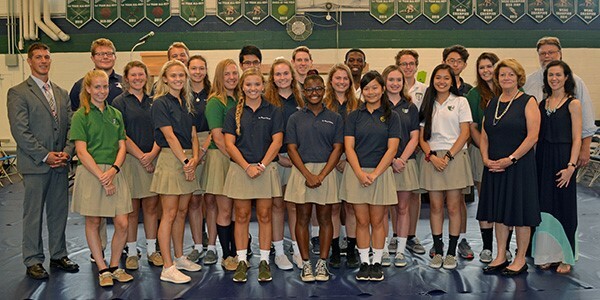 St. Mary's Ryken recently announced the new Xaverian Brothers Sponsored School (XBSS) stewards for the 2018-19 school year. Called to participate in the work of service and stewardship in the tradition of the Xaverian Brothers, SMR XBSS stewards dedicate themselves to carry on the Xaverian charism and ministry of our school and the community. Joined to Christ and following the example of Theodore Ryken as a "servant leader", they will help by their work to make this world worthy of God. "Peace to all these Stewards who share in this ministry of service and stewardship among all the Xaverian Brothers schools and St. Mary’s Ryken," said SMR President Mary Joy Hurlburt. The XBSS Stewards are a group of seniors who act as a living witnesses to Christ in our school community. The stewards serve on behalf of our school and are called to keep the spirit and traditions of the Xaverian Brothers alive by spreading excitement about faith, service and our Catholic identity. It is one of the biggest honors of a SMR student to be chosen as a XBSS Steward. Back row from left: Mr. Joe Wysokinski (Dean of Students), Evan Domonkos, Peter Trossbach, Aerron Capulong, Andrew Beckman, Raphael Civil, Sam Silverstone, Josh Kim and Mr. Chris Shea (moderator and Campus Minister). Front row from left: Sarah Sakne, Olivia Taylor, Sydney Walker, Joy Dewar, Jennifer Tennant, Carleigh Wood, Kellyn Murphy, Sierra Hawkins, Abigail Halterman, Catherine Nguyen, Madison Dean, Raina De La Cruz, Lydia Bowman, Mrs. Mary Joy Hurlburt (President), Ms. Mary Rose Depperschmidt (moderator and theology teacher).